However, when I run the app in the simulator, it appears sideways and in portrait mode. How can I switch the emulator to landscape mode on a mac? It's running the 1.6 SDK. For Mac users, you only need to use the fn key if the setting "Use all F1, F2 etc. keys as function keys" (under System Preferences -> Keyboard) is checked. left-ctrl+F11on Windows 7 It works fine in Windows 7 for android emulator to change the landscape orientation to portrait and vice versa. Not sure about your question - "sideways" is the same as "landscape". 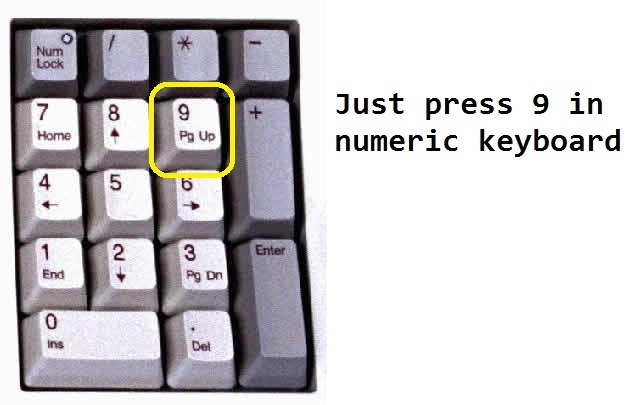 Just use 9 in numeric keyboard with num-lock off. 7 rotates in the opposite direction. I have found that sometimes the CTRL + F11 combination just doesn't do it for me. I have solved it by disabling the keyboard input in the emulator settings. 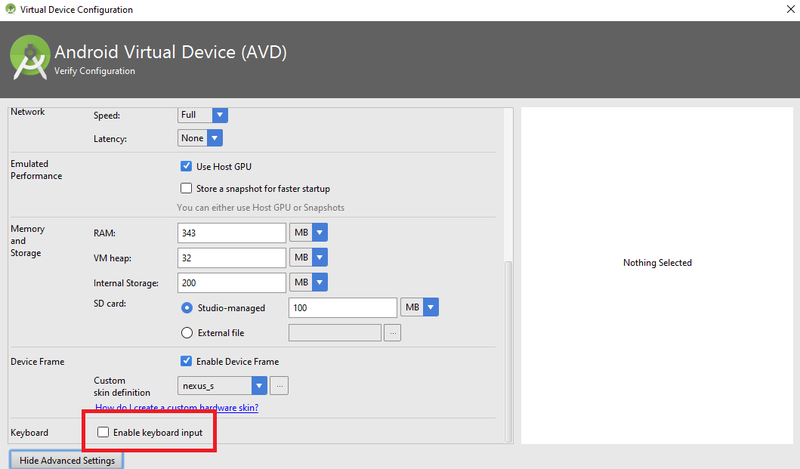 To do that, go to your emulator settings, klick the "show advanced settings" button and scroll all the way down. Then, disable the "enable keyboard input" option. After doing that, try to start your emulator again, and the CTRL + F11 combination should work. Ctrl + F11 works wonderfully on Ubuntu / Linux Mint. The complete listing is buried in the android docs, and i only found it via google / dogpile. That link has the emulator shortcut keys as of right now. This is now much more intuitive. The AVD interface now includes a sidebar with various functional shortcuts. The buttons circled in blue will rotate the device clockwise and counterclockwise on the screen. Just a little bug (Bug for me) I found on mac emulator. In my windows-8 laptop, ctrl + fn + F11 works. Ctrl + F12 also works well on linux(ubuntu). -launch the emulator -install your app -launch your app -make sure that your Num lock is on -Press '7' &'9' from your num pad to change your orientation landscape to portrait & portrait to landscape. For those of you with a Chromebook Pixel/Ubuntu/Crouton with no numpad, installing the onboard keyboard worked for me. If you're on Unity already, onboard may already be installed, so just type onboard from your command line to see if it's there. If you can not switch to landscape(or portrait) while using ctr+f11/12 Maybe the virtual device (android phone) itself lock the rotation. Going to the android control center (pull down on the home page), and unlock. 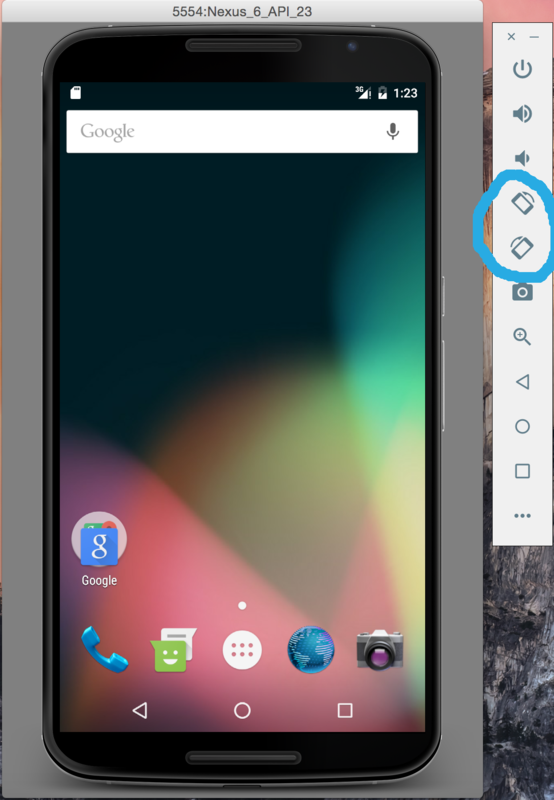 To switch to Landscape mode in android emulator u have 2 ways to accomplish. How to change my emulator from portrait to landscape mode? Test my app on a Tablet ICS emulator?